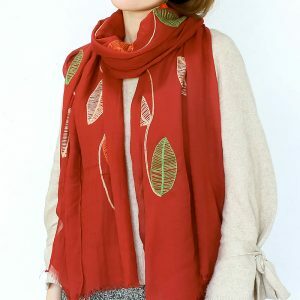 FEATURES Fashion leaf embroidery, with cotton and linen fabrics, high-end atmosphere, fashion and wild. 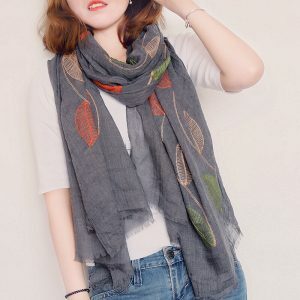 It is suitable for healthy cotton and linen fabric, which has good air permeability, soft and delicate, and comfortable to wear. Hand-made double-sided embroidery, exquisite patterns, cotton and linen feel, stylish atmosphere. 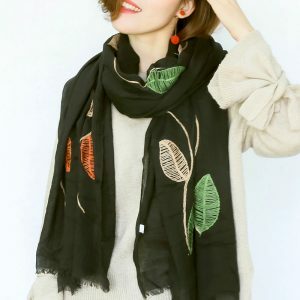 This scarf is not easy to wrinkle, it is three-dimensional and elegant when worn, the version is good, and the three-dimensional is crisp.